Athletes climbed the frozen Tortum Waterfall at the Ice Climbing Festival that took place in Erzurum, Turkey, Jan 30, 2019. Ice sheets reaching a height of 300 meters at the waterfalls in Erzurum's Uzundere district offer unique routes and opportunities for mountaineers in search of alternative ice-climbing in the world. The frozen waterfalls of Uzundere, one of the many "slow cities" in Turkey, is considered a rival to the Alps, as ice climbing the frozen waterfalls has peaked in the city. Erzurum, which is one of the cities where winter is hard and tough, has turned harsh winter conditions into income and entertainment, becoming more popular day by day. The first to kick off the ski season and the last to close it, Erzurum has spread winter tourism throughout the year. With the only ski jumping hill in the country, the Palandöken and Konaklı ski centers and various facilities and sports centers, the city offers important opportunities to those interested in winter sports, such as skiing, snowboarding, alpine skiing, ski cross, biathlons, ski jumping, curling and ice skating. The Uzundere Valley, Erzurum, Turkey. The popular ski center Palandöken attracts those who want to enjoy the facilities in the city as it offers easy access by road and air and good local food. It also hosts local and foreign tourists in hotels with its 12-kilometer-long alternative tracks, offering people day and night ski opportunities. The city, which attracts more guests every year, has been attracting people with its natural beauty and alternative winter sports opportunities in the Cittaslow Uzundere district in recent years. Welcoming tourists in the summer with its natural beauty, the district has been hosting world-famous mountaineers who want to climb with other extreme sportspeople in the Cevizli region. Mountaineers and extreme sportsmen from around the world and Turkey climb on different routes in the unspoiled natural environment of the region, where the waterfalls, between 25 and 300 meters in height, are covered in ice. While the city is covered with a shroud of snow, Uzundere district, which has less snow, provides easier transportation and safe climbing for sportsmen. In this respect, it is more advantageous with its unique routes and opportunities for mountaineers who want to climb on the ice masses frozen of the waterfalls. 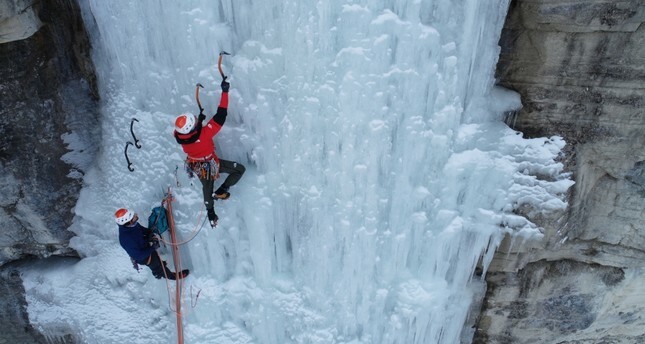 It is an alternative to the Alps, where ice climbing is most common in Europe. One of the mountaineers who has climbed in Uzundere, Azerbaijani Mountaineering Federation President İsrafil Aşurlı, told Anadolu Agency that he has climbed many mountains, including Mount Everest, to date. "I was so surprised when I first saw this place. Turkey is actually known for its warm weather. I have never heard that ice climbing was possible here; however, there are many perfect frozen waterfalls in Uzundere," he said. Noting that ice climbers generally visit the Alps, Aşurlı stressed: "The difficulty level changes in line with the waterfalls. A track of 300 meters opened in Uzundere, and this is a long distance. Our French friend Mathieu Maynadier tried this track today. Ice climbers do not know the potential here yet." Aşurlı who has some duties at the International Mountaineering Federation said: "Especially when I look at the increase in the number of sportsmen coming here for ice climbing every year, I can see the potential of this place. The most important advantage of Erzurum over other international ice climbing regions is its environment. Its natural structure is definitely different from other regions, and its historical richness makes this place different." World-famous French mountaineer Mathieu Maynadier said he came to Erzurum for ice climbing four years ago for the first time. Stating that he has continued to come to Erzurum ever since, Maynadier explained: "I have been a professional mountaineer for 15 years. There is potential for ice climbing performers here. The originality of the region comes from its being untouched in terms of climbing. We are a little bit unlucky as the weather has been warm this year; however, we climbed different routes every day. As it was warm, we climbed the tracks that we climbed before again." Maynadier said ice climbing is common in the Alps in Europe and reported: "Erzurum has an interesting feature when compared to the Alps: there are not as many mountaineers who have climbed here before. This is quite good for us as we have an opportunity to climb new tracks every time. I know that this place will be a popular haunt soon. Ice climbing is so common in countries like the U.S., Canada and Norway, but these regions are not like Erzurum. Those who want to have an original experience should see Uzundere. This region is exotic for ice climbing. People who want to have an original tour should try this place." Charles Noirot, Maynadier's teammate, also highlighted that Uzundere's beauty, but they coincided that it was almost too warm for climbing. Noirot stated that Erzurum is colder in winter and added: "The weather was more suitable for ice climbing two weeks ago. I will visit two weeks earlier next year. I have been ice climbing for three days. There are hard and nice tracks here. I will go to Antalya for mountain climbing. Turkey also has a potential in terms of mountaineering."